Update: Since late 2011, Revolutionary Burger has been “closed as they prepare for the next phase of the Revolution”. I’ll update this when I hear that they are back in business (if ever). 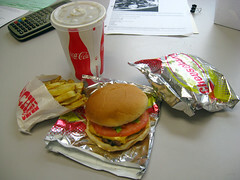 Lunch today was an experiment, I got two Che Burgers, fries, and a root beer from Revolutionary Burger. Revolutionary Burger is a bit of an interesting experimental concept, in that they don’t have a storefront, and aren’t their own restaurant, they are basically a sub-restaurant of the local Lebanon restaurant, Gusanoz. Apparently, one of their employees recently went on a trip to Southern California, and really enjoyed a trip to iconic In-N-Out Burger, and decided to try making a similar burger here. So they invented the Rev Burger, which is their rendition of the basic In-N-Out-style California burger: 100% real beef, never frozen, char-broiled over open flame, a toasted bun, lettuce, tomato, onion and, of course, the “special sauce”. You can order it with american cheese as well, making a “Che Burger” (Anyone else chuckling at the irony of having the Che Burger made with American cheese?). You can even order them In-N-Out style, for example, ordering a “2×2” which is two patties and two slices of cheese. They also offer fresh-made fries, shakes, and beverages (basically, a similar small menu to the In-N-Out they are copying). However, they don’t have a storefront. Revolutionary Burger is run out of Gusanoz’s kitchen, but is primarily a takeout business, with optional pickup at the bar inside Gusanoz as well. Prices are reasonable, however, with my Che Burgers costing $2.24 each, the fries $1.49, and my root beer (draft root beer from Eli’s in Maine) was $1.49 as well. So I opted for two Che Burgers, fries, and root beer, placed my order, and drove over to Gusanoz. When I got my order, I could immediately tell they were doing something right, since the order smelled right, with a strong smell of fresh fries and a hint of charbroiled beef coming out of the bag. Getting back to my office and opening it all up, I was a little less than impressed by the packaging, but I did find two nicely assembled (and not crushed, like oh-so-many burger places seem to do…) burgers hiding within. Were they successful in the idea of duplicating the In-N-Out concept? I think they actually got the fundamentals right. The burger was nicely done, with a good seared crisp on it, but still juicy and not overcooked, resulting in a rather nice beefy texture. The topping were fresh, crisp, and well-assembled (one of the things I’ve always liked about In-N-Out is that I get a burger that actually looks pretty close to their menu pictures… Revolutionary Burgers isn’t quite as meticulous, but still obviously isn’t just slapping burgers together off an assembly line). The big difference from In-N-Out was the “Special Sauce”, which unlike most resembled mayo more than Thousand Island dressing, and had a distinct pepper bite to it. The bun was lightly toasted as well, which is always a good touch. All in all, this was a good burger, and does justice to the concept they were shooting for. Not everyone will like this style of burger, but for those that do? They’ll like it. The fries were good as well. I really, really prefer fries properly done in the Belgian style, which requires two rounds of cooking (one at low temperature to cook the interior, and a second frying at high temperature to crisp up the outside). Like many places that work with fresh potatoes, Gusanoz single-cooks them, which makes them a little starchy my tastes, but these were otherwise good fries. They put a light dusting of seasoned salt on them as well, which gave them a nice extra kick without overwhelming them. Overall, I was pleased with this lunch, although I find the concept a little bit odd, in that I’m not used to getting my burgers out of the back of a Mexican restaurant. I’m also concerned a bit that splitting off into a burger business might not be the greatest idea for Gusanoz… I’m not alone in my beliefs that Gusanoz has gone downhill in both quality and service recently, and trying to run a burger business as well is probably going to distract them a bit from the Mexican side restaurant. I’ve always thought that you should do one thing well before branching out. But at least the burger was good. Interesting. I had not heard. So they wouldn't let sit at the bar area and eat it? I didn't actually ask if I could eat there, I had a lunch meeting to go to. Next time I'm there to eat Mexican food, I'll ask them. I think that with the low price of the burger they probably can't afford to let people eat them in. It gets weird if you let people have chips and salsa (or even just water and service) and not others. Also they have Gusanoz burgers on the menu in the restaurant. I haven't confirmed it but I'm pretty certain they really don't want to serve them there. John's got a really good point, I didn't think about how that would integrate with their eat-in restaurant. Anyone know if they have it on menu in Hanover takeout location? Wow, I had lunch at Gusanoz yesterday and either I'm completely oblivious or there's no way to know you can get take-out burgers there. Seems like a sign would be a good start. And yes, they had one waitress for 20 tables. I know somebody who applied to be on the wait staff there, but had already taken another job before they called back. Probably their prices are too low (other than $2.19 for a cup of iced tea…) so they can't afford the management help they need. What do I know, the chimi and salsa verde were tasty, even if it took an hour for a lunch-special lunch. I'm a big fan of places like these. Like the sound of the mayo/pepper condiment too. Can you get your che or rev burger animal style? Bill: I stopped going there for lunch since it was usually too slow. It's frustrating in the good-restaurant-gone-bad way, since the food is almost always spot on and decently authentic for an area where most people still think Taco Bell is pretty good. Dennis: I don't think Revolutionary has a secret menu. I'll try that as an experiment. So, I tried it last night. We liked the che burger but the fries didn't travel well at all. They were limp by the time I got them home. Not good for a pick-up/delivery only business. And the "wings" on the menu are boneless fried chicken patties. NOT bone-in wings. Amy: my fries were still good, but I could see that if I had another 5 minutes they would be past their prime. I'm glad I didn't try the "Wings". Selling anything other than actually wings as "wings" is a pox upon our society, and should be treated as such. "Revolutionary Burger" only operates out of the Lebanon location. Amy, that's odd about the wings. When I tried them (via delivery) I got wings with my order and they were big, meaty, really quite good true wings. Some problem with the fries that you had, though. Thanks for all of the great feedback. We are keenly aware of the lunch ticket time issue and are taking measures to fix the issue. The wings that you received as chicken fingers are a direct result of us selling out on a given night. In the future we will advise people ahead of time. As for the fries, we chose a fresh-cut and cooked fry from a real potato as opposed to a frozen fry. I agree that they do not hold up while traveling, however the response overall has been very positive. People so far seem to appreciate the product for what it is: natural. The only way that I am aware of to keep fries rigid for any length of time is to coat them in starch like Applebee's and even our own Gusanoz fries. We wanted to stay away from that with Rev Burger. Please keep the comments coming! And those lunch times, Maria and I PROMISE that we will get them back to the 10 to 15 minute range within the next seven days. One of my annual traditions is volunteering at one of the local FIRST Robotics competitions, usually as a Robot Inspector or a Judge. This year’s volunteer assignment was for the New England District Championship at Boston University’s Agganis Arena, and that gave me another opportunity to check out some of the Brookline area dining options. One particular place had caught my eye since I had walked by it several times on last year’s “Death March” (my annual tradition of walking ~20 miles through an urban area, exploring neighborhoods and eateries that I normally wouldn’t visit). That place is right in central Brookline in the basement of a building: Roast Beast.